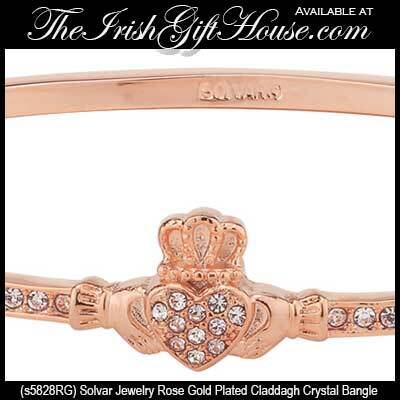 This Claddagh bangle bracelet is a hinged design that is finished in rose gold plating and is accented with crystals. 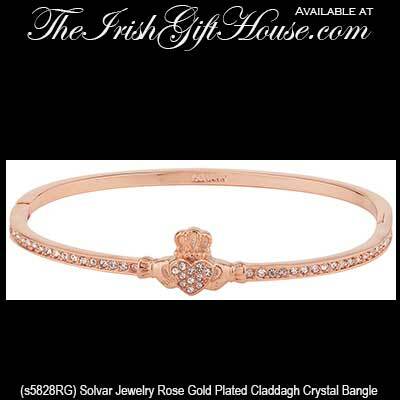 This rose gold plated Claddagh bracelet is a hinged bangle that is studded with crystals in the heart along with the front half of the bracelet. The bangle features a 3/8" tall Claddagh symbol along with a 1/8" tall shank and it is suitable for most women's wrists. The bracelet is crafted by Solvar Jewelry in Dublin, Ireland and it is gift boxed with the Galway Folklore and a Claddagh history card that is complements of The Irish Gift House.